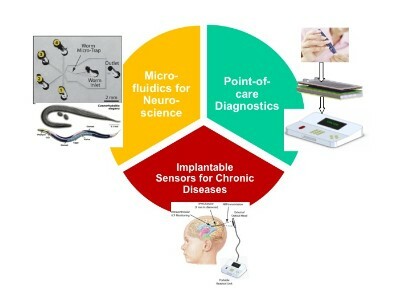 We are developing Micro/Nano Electroctro-Mechanical Systems (MEMS/NEMS) to address: (i) fundamental questions in neuroscience, (ii) clinical needs in the medical field. Bio-MEMS/NEMS in NeuroScience. How do neural circuits generate behavior? How the functionality of neural circuits is alterted with age? We combine micro/nano fabrciation technology with bio-imaging approaches to study the nervous system of the nematode C.elegans in vivo. We are also interested in developing solid-state nanoprobes for measuring membrane potential from neurons in vitro. Bio-MENS/NEMS in Medicine. We are interested in engineering point-of-care diagnostic biochips as well as in implantable medical devices. By integrating microfluidic and microoptical components, we are developing innovative tools for monitoring infectious diseases in the developing world as well as novel biosensing approaches for monitoring traumamtic brain injuries and diseases related to high intraocular pressure. The dialectic relationship between technology and science motivates our research!